LAKE LUZERNE – Patricia M. Kelley, 91, passed away Thursday, March 20,2014, at Saratoga Hospital after a brief illness with her loving family at her side. Born January 28, 1923 in Glens Falls she was the daughter of Clara (Hendree) and Jeremiah Daly. Pat was married to Joseph R. Kelley on June 19, 1944 and they resided in South Glens Falls until their children left to start their own lives. They moved to Lake Luzerne in 1995 and relished their time there. Pat was employed by Sears & Roebuck for many years. She was a loving mother and always involved with her family and friends. She was a self-taught artist in the medium of watercolor and recently had a one-woman show at the Lake-Luzerne Community Center. She loved gardening, cooking, and motivating those around her. Pat was an avid volunteer in her church (Holy Mother and Child Parish, Lake Luzerne) and several organizations, including the Hadley- Luzerne Lioness Club, The Bethany Guild of Holy Mother and Child Parish, Tri-Town Seniors, Hadley-Luzerne Historical Society/Kinnear Museum, and the Corinth Garden Club. She was a member of the YMCA (Corinth Branch AOA,) and the Senior Citizens Center of Saratoga Watercolor Art Class. Besides her parents she was predeceased by her husband, Joseph and two sons, David J. and R. Christopher Kelley, her brothers, Jeremiah, Joseph, Robert, Richard and Paul Daly, and sister, Theresa Maranville. Pat is survived by her daughters, Mary (Dennis) Elms of Beaverton, OR, Patricia Kelley Iacobelli of Saratoga Springs, NY, and son, Richard (Dana) Kelley of Argyle, NY. Grandchildren include Michael and Kristen Kelley, Dennis and Jason Elms, Jordan Kelley, Bryna (Shawn) May, Thomas and Sean Iacobelli, Great grand children, Layla and Bode May as well as several nieces and nephews. Pat donated her body to the Anatomical Gift Program of the Albany Medical College. To leave a message of condolence for the family, please visit www.HansFuneralHome.com. There will be no calling hours. Pat was a communicant of Our Holy Mother and Child Parish, 297 Lake Ave., Lake Luzerne, NY. 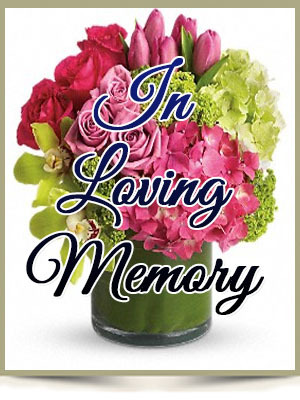 A Funeral Mass will be held there on April 5th at 11:00 a.m. A reception hosted by the Bethany Guild will follow. All who knew and loved her are invited to attend along with her family. In lieu flowers donations may be made to the Hadley-Luzerne Lioness Club, P.O. Box 547, Lake Luzerne, NY 12846. We are so sorry to hear of your loss. Although we never had the pleasure of meeting your mom she sounds like a wonderful person and I know that you will miss her a lot. You are in our thoughts and will continue to be in our prayers. Sending love……. I just found out and am so sorry to hear about Pat. She was a lovely woman and wonderful neighbor. We will miss seeing her and her beautiful garden. There will never ever be another like you, Grandma Kelley.